Last night Chris and I went to my parents house as my sister-in-law Heather and our nephew James had just come up from North Carolina. I really wanted to see them in case I don’t feel well over the next few days. Shortly after arriving and getting lots of hugs and listening to all his funny sayings and stories, James decided it was time for my birthday present. We were actually washing our hands because I had just explained to him how important it is to get rid of the germs and how it helps keep Aunt Ber from getting sick and him too. So while washing our hands I told him to sing happy birthday twice and that’s how long it takes to make the germs go away. He said it’s not my birthday and then said something else really fast which I didn’t understand and ran out of the bathroom. When I came back to the kitchen he was grinning from ear to ear and had a present for me all wrapped up. “But it isn’t my birthday yet” I said. James said open it. So I did. Watching the excitement on his face was priceless. I unwrapped the present to find James’ original daddy doll. He recently got a new larger one and thought “I will give this to aunt Ber and it will make her happy and she will give me a hug” My God I love this little boy. For those that don’t know what a daddy doll is let me tell you. 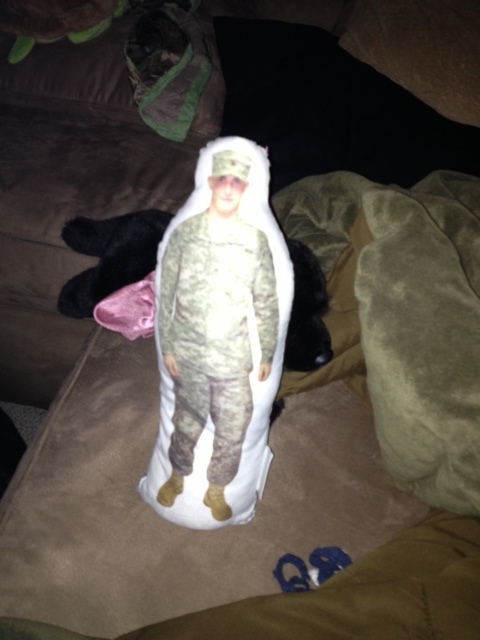 When Justin was deployed to Iraq and James was just an infant heather had this stuffed doll made with Justin’s full picture on it. He carries it with him everywhere. So while Justin has been in Afghanistan Heather had a new one made for him. So now I have my little brother with me to make me happy and give me strength. The power of a child’s love is amazing. One day I’ll explain to him just how incredible is moment was for me. I have the best Godson/nephew ever. I’m sure the nurses will love when I walk in for chemo with my turtle, my dog, and my brother doll! Speaking of which, I gotta go eat! Hospital bound in 30 minutes!